January 14, 2016 January 9, 2016 / Elizabeth T.
LA has been awfully chilly lately, partly because California’s finally been graced with some rain (yay! ), but I’ve been loving the gloomy and cold weather because it means I can finally bring out all of my thick and chunky knits for some cozy layering! 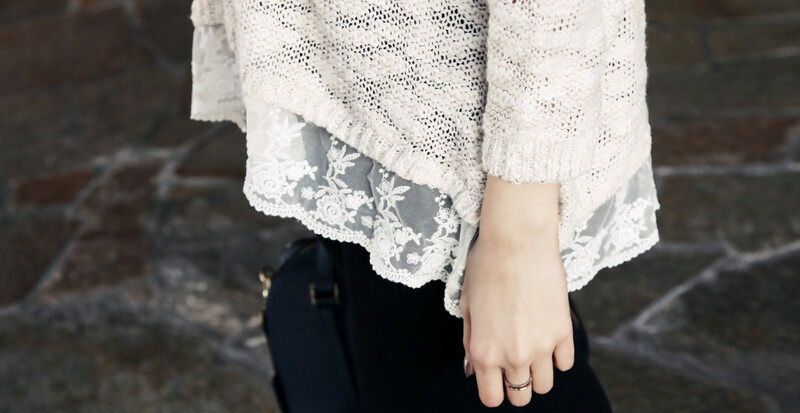 One of my favorite sweaters this season is this bohemian chic number. I love how loose and easy fitting it is, yet the lace hem gives just the right touch of subtle femininity to an otherwise casual sweater. The material is also so soft and comfortable, making it the perfect sweater to wear on an off day. Rather than pairing it with my usual favorite skinny jeans, I opted for a pair of denim shirts and tights because I wanted my new oxfords to get some more exposure. I love how shiny they are, and the bone color makes it stand out so much in comparison to the usual black oxfords that I’m used to seeing. And of course, I finished off the whole ensemble with my new Kate Spade navy blue bag. I love how structured it looks, making it the perfect item to balance my bohemian chic outfit. I love the simplicity of this outfit. I’m so freakn In love with the sweater and shoes. The tight and short is making your legs forever loooooooooong, popping the sweater and oxford shoe out! Beautiful pictures Elizabeth! You’re rocking the bohemian chic look girl ❤ Loving your WHOLE outfit, that sweater is perfect and your oxfords omg. Aww thank you Lynna ❤ 🙂 You're too kind! Haha the bohemian chic look is one of my favorites these past few months! Lots of love your way, babe!! Thank you so much Nadia! 😀 I really love the sweater too because it’s so cozy and warm ❤ The lace adds just the right touch femininity, don't you think? And yes FriYAY!! Lots of love to you too, Nadia! love the clean, minimal look! those oxfords are to die for! Love this sweater! The lace hem detail is so cute! Thank you so much Jane ❤ I really love the lace detailing of the sweater as well! I want the shoes ! lawd they are cute . your whole outfit is on point . Hahah aww you’re too sweet love ❤ 😀 Thank you so much for stopping by my blog! Haha yes! Actually, I’ve thought about living in England before – maybe not for forever, but I’d definitely like to stay for at least half a year to a year 😀 I love the accents so much! And aww, no sun since August? 😦 And thank you love ❤ I'm glad you like the outfit 😀 Wishing you a great week ahead as well! Hey there! I followed your blog and it’s an amazing blog! I personally like it. I followed your blog so would you follow mine too? We could be friends!! Nice to know you ❤ IM IN LOVE LIKE REALLY IN LOVE WITH YOU AND YOUR LOOK AND YOUR STYLE! Loving this look the colour combination and photos are amazing!!! That sweater is so pretty! I love the oxfords paired with it, such a cute and casual outfit 🙂 Lovely look! Aww thank you so much Kiki ❤ Glad you like the sweater! 🙂 It's one of my favorites to wear right now because it's so chic and cozy! I love this sweater, it’s so effortless, but looks amazing! the colour is lovely as well. Thanks for sharing! Thank you Cailey 🙂 It’s one of my current favorites – so comfy yet chic (especially with the lace detailing)! Cute outfit 😉 Love the shoes. Thank you so much Tiffany ❤ These shoes are my current favorite, and I haven't been able to stop wearing them 🙂 At first I wanted the black ones, but I'm so glad that I got these instead! Have a great week as well, Tiffany! Thank you so much Lauren! 🙂 Haha yes, the shoes! 😀 ❤ Have a great week ahead! Can't wait to see more on your blog too! Aww thank you so much Carsla ❤ You're too sweet! And yes, you definitely should especially since it's almost spring! Haha I know, right? 😛 Can’t look too ‘chunky’ despite it being so cold 🙂 Thank you so much Annie 😉 ❤ Hope you're having a great week too! Love your top! Enjoy your week! nice outfit! I really love your sweater! Very beautiful look, i like your style!